Is the image that I bring today is very ugly and many can not you say anything … I do not actually say anything. This is an image of high spectrum where Hubble, which are galaxies appear. Yes, I have today decided not to bring you one star or galaxy, but a lot of them, and for what? I will say, to see the immensity of the universe. 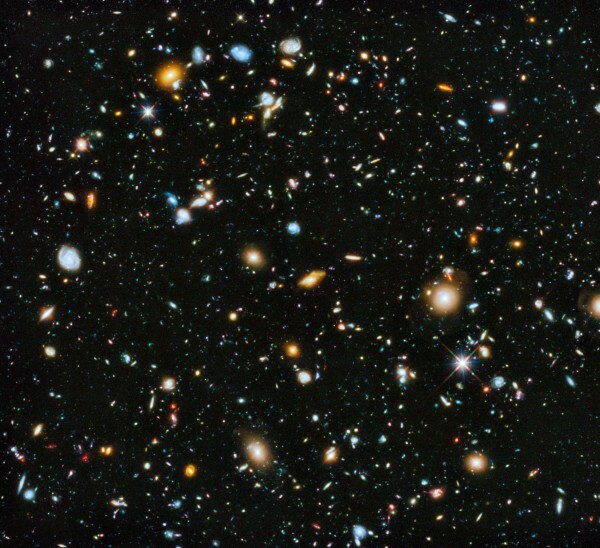 In each of the galaxies we see (a small fraction of which are believed to exist, about 180 billion galaxies) has about 100 billion stars (on average) and in each, on average, can be 3 planets. It is estimated that there are 10 ^ 24 stars, that is, 1 January and 24 zeros after it (if I remember correctly septetrillones thousand or a million septetrillones, if you count that high, which I doubt). Come on, in terms of either, a lot of piles. There, you sit reading this, you can not really do idea of ​​the amount of things we still need to see out there, and above all, how small we are (and our lives). For those who think the “I’m going to make history,” These numbers should put them down-to-earth and something very very very very fat have to do to change the life of this universe. This also indicates that, with these numbers, something is out there if or if. We can not know if life is very similar to the one here, although expected that at least our life solutions to the problems are more universal than we can think. And if we put that last math explaining the multiverse as a mathematical kaleidoscope, where there are millions of universes, we were even more obtuse thinking of so astronomical amounts involved. If by string theory and vibration of the membranes can “think” that there are other universes natural vibrating similar to ours, although his show have to do with the scale of colliding particles Plank million energy levels times the LHC to see how to achieve the vibration of matter by gluons and symmetry of these basic elements of matter. Right now, we have a very strong scientific debate about the generation and possible coexistence of these strange theories. Update: By the way, when I talk about Kaleidoscope multiverse I mean turning a little physical constants have another possibility (on the same basis) from another universe existentially difernete this. These are the current studies being a brilliant math / physics in Cambridge. And best of all, the math works, but the problem is. as we see, even though mathematically possible not indicate that physically … but the math (complex of balls) going great.